In corporate finance, a leveraged buyout (LBO) is a transaction where a company is acquired using debt as the main source of consideration. These transactions typically occur when a private equity (PE) firm borrows as much as they can from a variety of lenders (up to 70 or 80 percent of the purchase price) and funds the balance with their own equity. Why do PE firms use so much leverage? Simply put, the use of leverage (debt) enhances expected returns to the private equity firm. By putting in as little of their own money as possible, PE firms can achieve a large return on equity (ROE) and internal rate of return (IRR), assuming all goes according to plan. Since PE firms are compensated based on their financial returns, the use of leverage in an LBO is critical in achieving their targeted IRRs (typically 20-30% or higher). While leverage incrases equity returns, the drawback is it also increases risk. By strapping multiple tranches of debt onto an operating company the PE firm is significantly increase the risk of the transaction (which is why LBOs typically pick stable companies). If cash flow is tight and the economy of the company experiences a downturn they may be be able to service the debt and will have to restructure, most likely wiping out all returns to the equity sponsor. What type of company is a good candidate for an LBO? Generally speaking, companies that are mature, stable, non-cyclical, predictable, etc. are good candidates for a leveraged buyout. Given the amount of debt that will be strapped onto the business, it’s important that cash flows are predictable, with high margins and relatively low capital expenditures required. This steady cash flow is what enables the company to easily service its debt. In the example below you can see in the charts how all available cash flow goes towards repaying debt and the total debt balance (far right chart) steadily decreases over time. The above screenshot is from CFI’s LBO Model Training Course. 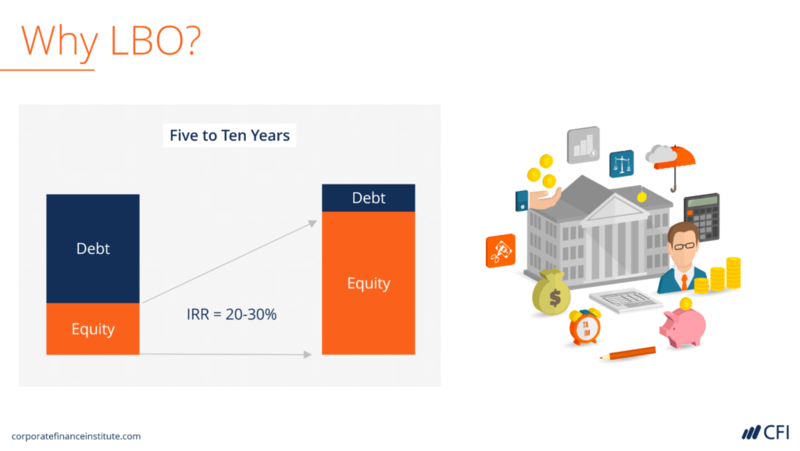 What are the steps in a Leveraged Buyout (LBO)? The LBO analysis starts with building a financial model for the operating company on a standalone basis. This means building a forecast five years into the future (on average) and calculating a terminal valueKnowledgeCFI self-study guides are a great way to improve technical knowledge of finance, accounting, financial modeling, valuation, trading, economics, and other areas. These resources give you the technical skills you need to advance your career in investment banking, equity research, corporate development, and other areas of for the final period. The analysis will be taken to banks and other lenders in order to try and secure as much debt as possible to maximize the returns on equity. Once the amount and rate of debt financing is determined, then the model is updated and final terms of the deal are put into place. After the transaction closes, the work has just begun, as the PE firm and management have to add value to the business by growing the top line, reducing costs, paying down debt, and finally realizing their return. Image Source: CFI’s Leveraged Buyout Course. 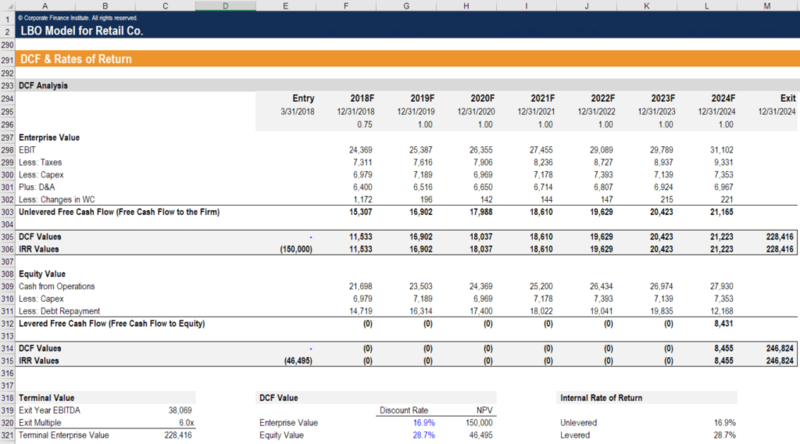 Below is a screenshot of an LBO model in Excel. 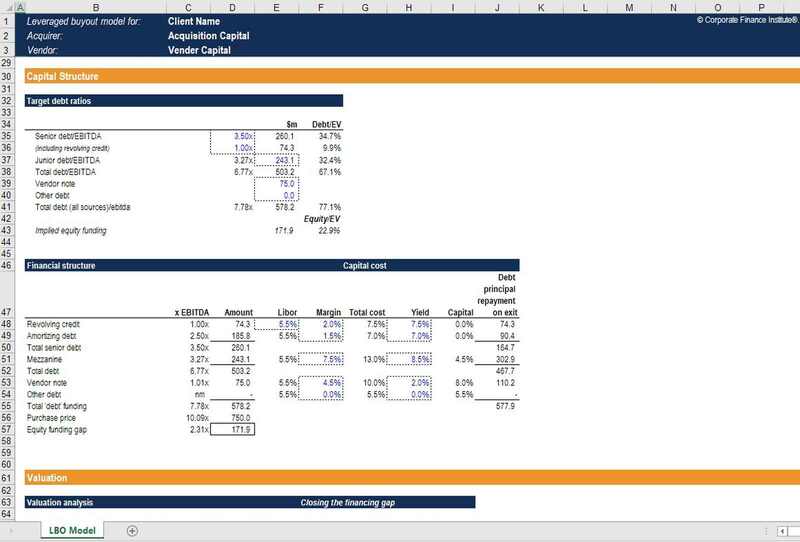 This is one of many financial modeling templates offered in CFI courses. To learn more about the above model with step-by-step instruction, launch CFI’s LBO financial modeling course now! Read more about a specific type of LBO called a management buyout (MBO). Check out our resources section to learn more about corporate finance, and explore CFI’s career map to find the path that’s right for you. Make yourself stand out from the crowd with financial modeling courses and finance certifications.